Your lawn could be affected by gray or pink snow molds. Your lawn is susceptible to gray or pink mold if snow has covered your turf for nearly a month or more. These molds develop since snow acts like an insulator warming the surface temperature and encouraging mold growth. Your lawn can get winter desiccation which means it could dry out from excessive wind damage. 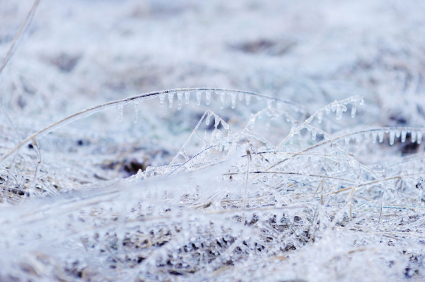 Your lawn could suffer from ice damage where water can’t properly drain, ice forms and damages the grass beneath it. De-icing products from your municipality’s efforts to keep snow off of the road can be swept up onto your lawn. And the salt products that you use to de-ice your driveway and sidewalks can drain into your lawn’s soil. Meadow voles can take up residence beneath the ground and feed off of your grass. What can you do to avoid these killers? To avoid snow mold, or at least limit its damage, make sure that you mow your lawn until it’s completely dormant for the winter. Planting hardier, cooler weather grasses, like rough bluegrass, creeping bentgrass, Kentucky bluegrass, colonial bentgrass, annual bluegrass, tall fescue, and red fescue. However, avoid planting perennial ryegrass because it doesn’t fair well under heavy snow conditions and tends to be more affected by gray and pink snow mold. During your fall lawn care regimen, avoid using a lot of fast-releasing nitrogen fertilizer on your lawn. The excessive nitrogen encourages gray and pink snow mold growth. Make sure you put your lawn to bed by dethatching, core aerating, leaf removal, and improving water drainage in your yard. To prevent vole damage, keep your lawn at least 2 ½ inches long when you complete your final mow for the season. To better protect your lawn from winter desiccation, make sure that you apply slow-releasing fertilizer during your fall lawn routine to encourage strong plant root growth over the winter months. If you live in an area where winter desiccation is inevitable, consider putting up a snow fence to protect your yard from wind damage. If your lawn suffers from a lot of icing due to poor water drainage, install a drainage system that allows water to be absorbed into the ground rather than allowing it to pond and freeze. All is not lost if you haven’t gotten around to these chores before the first major snow fall. Yet, you will probably have to do some lawn repair come the spring. No method is fool-proof because we can’t control Mother Nature. However, these preventative steps may protect your Cleveland or Columbus, Ohio lawn from being completely destroyed this winter. Need More Help Getting Ready for the Winter? Get the Guide! Weed Pro can help you get ready for the winter with our Ultimate Fall Lawn Care Guide that will guide you step-by-step! Learn important fall maintenance tips for your lawn and landscape that will ensure you a beautiful spring green-up. The best part of this guide is that it's yours absolutely free by clicking on the button below!